How Does Your Organization Handle Unemployed Workers? A recent NPR story titled, Job Seekers Find Bias Against The Unemployed, reported a growing concern and feeling among unemployed workers about the hurdles they face when trying to get new jobs in today’s economy. The hurdles begin with the sheer numbers of it all. The Bureau of Labor Statistics reports that 25 million workers unemployed or under-employed looking for jobs. Astoundingly, those numbers amount to five unemployed workers for every single job opening in the economy. And unfortunately the number and percentage of people who have been unemployed for more than six months has risen sharply since 2008. If They’re Out of Work, Are They Out of Luck? Job seekers also report an increasing sense of discrimination over their unemployed status. The sense is that employers only want to hire people who have jobs and that there must be “something wrong with you” if you’re unemployed. There are people within the hiring circles who have confirmed these perceptions and tell stories of companies who outright avoid hiring unemployed workers. The reason is, in fact, that many believe that in a tight economy the best of the best are employed, not being laid off. On the other side of the debate some staffing experts point out that given the massive layoffs in the economy, hiring managers have an excellent opportunity to find top performers amongst the pool of unemployed. In fact, the chance of this happening is probably greater than at any other time in history. Our opinion is in line with the later perspective. As employers we have to look at today’s job market as an opportunity to fill open positions with the very best talent around. And the pool of talent considered should come from any source, unemployed or not. Not only is it very likely illegal to discriminate against someone on the mere fact that they are unemployed, the fact that black and Hispanic workers, in particular, have historically higher rates of unemployment the potential for discrimination complaints is of great concern. Considering the large number of applicants that are likely to appear for an open position in your organization, how can you, the hiring manager, deal with the onslaught and pick out the best of the best? There are many tools available to help. One tool we’ve introduced with the specific needs of today’s job market in mind, is Tru-View. Tru-View is an applicant-driven online reference verification system that can be used early-on in the selection process to gain insight about an applicant that would otherwise require a significant investment in time and energy to attain. With Tru-View hiring managers enter candidate information into the system and the applicant is then invited to submit their reference sources into the online portal. Reference sources are then invited to log into Tru-View and complete an anonymous assessment of the individual and those results are compiled into an insightful summary report emailed to you for review. The fact that this process can be done early on, in a quick and cost-effective manner, makes it ideal for the initial “weeding out” of a group of pre-qualified candidates. Another tip for building your workforce in light of today’s high unemployment is to conduct a deeper level of employment screening than you might normally conduct. The extra effort and expense associated with vetting these employees is minimal but will go a long way toward selecting the best of the best among a large pool of qualified candidates. Screening beyond the basics, as long as it’s still job-related and conducted in a consistent manner, can give you the extra edge you need to bring in the right people. Probably the most important point that comes out of the NPR article referenced above is the need for employers to avoid bright line policies. Policies that disqualify an applicant solely on the basis of their employment status is a potentially huge mistake and one that should be avoided in most (if not ALL) situations. 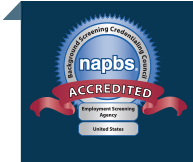 Let us help you devise an effective employment screening program.